Do you know a lot about Jesus? Do you believe all the right things? But does God seem distant to you? Jesus wants to change that. Click on the video and invite Jesus to dinner. How have you invited Jesus to dinner? Just leave your comments in the box below. I never thought of it that way, inviting Jesus to dinner, it’s true I’ve been afraid to get too close to Him thinking that I may spoil or have something bad happen while He was at my home. Thank you for the encouragement to try it and this time I am all for Him to have time with us. Most recently, I’ve asked Jesus to come in and show me how to be led by the Holy Spirit in everything I do. (I’m getting lots of practice). I’ve asked Him to stay for breakfast, lunch and dinner… Every day! Thank you Brother Grant, for your faithfulness to show us how to have a closer walk with Him… how to avoid the pitfalls and lead a transformed life. I so look forward to your uplifting messages each week. God bless you and yours. You’re welcome. As God shows me things that help me personally, I like to share them with all of you. Glad you find them helpful. Hi Grant: Thank you for this blog video. At the church I attend we are currently doing a study which is very much along the lines of this video. We have discovered that it is indeed FEAR that is holding a lot of us back. Fear of what will be required, fear of what it will look like and not knowing what it will look like even though we know that it will be better and most beneficial for us because a closer relationship is just what God wishes for our lives. Thank you that we all seem to be on the same page. During the day whilst I’m working it is easy to forget to abide in Jesus but your video makes it so simple and it shows me what I’ve been missing out on. 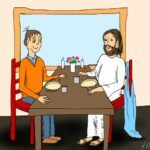 Not only will I invite Jesus to dinner, He can come for all meals; He can come to the supermarket with me; I’ll pull up a chair for Him to sit with me at work and He can drive around with me. That way I get to spend the whole day with Jesus. Once again thank you for your ‘reminder’ videos which always tend to bring me back on track.